In ancient Greece the continued existence of the dead depended on their constant remembrance by the living. 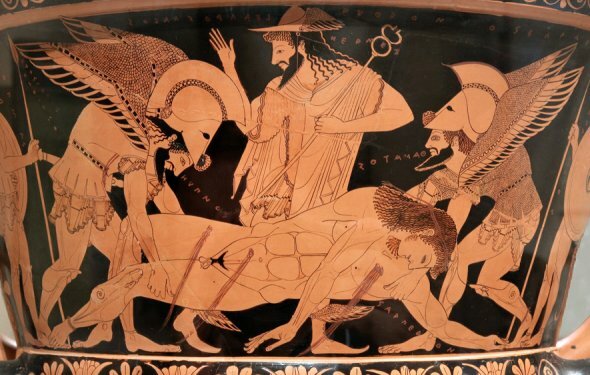 The after-life, for the ancient Greeks, consisted of a grey and dreary world in the time of Homer (8th century BCE) and, most famously, we have the scene from Homer's Odyssey in which Odysseus meets the spirit of the great warrior Achilles in the nether-world where Achilles tells him he would rather be a landless slave on earth than a king in the underworld. By the time of Plato, however (4th century BCE) the after-life had changed in character so that souls were better rewarded for their pains once they had left the earth; but only in so much as the living kept their memory alive. The afterlife was known as Hades and was a grey world ruled by the Lord of the Dead, also known as Hades. Within this misty realm, however, were different planes of existence the dead could inhabit. If they had lived a good life and were remembered by the living they could enjoy the sunny pleasures of Elysium; if they were wicked then they fell into the darker pits of Tartarus while, if they were forgotten, they wandered eternally in the bleakness of the land of Hades. While both Elysium and Tartarus existed in the time of the writer Hesiod (contemporary of Homer) they were not understood then in the same way they came to be. In Plato's dialogue of The Phaedo, Socrates delineates the various plateaus of the after-life and makes it clear that the soul who, in life, devotes itself to the Good is rewarded in the beyond with a much more pleasant existence than those who indulged their appetites and lived only for the pleasures the world has to offer. As most people, then as now, viewed their lost loved ones as paragons of human virtue (whether they were or not, in fact) it was considered one's duty to the dead to remember them well, regardless of the life they had lived, the mistakes they had made, and, thereby, provide them with continued existence in Elysium. This remembrance was not considered a matter of personal choice but, rather, an important part of what the Greeks knew as Eusebia. We translate the Greek word `Eusebia' today as `piety' but eusebia was much more than that: it was one's duty to oneself, others and the gods which kept society on track and made clear one's place in the community. Socrates, for example, was executed by the city-state of Athens after having been convicted of impiety for allegedly corrupting the youth of Athens and speaking against the established gods. However unjust we may see Socrates' end today he would, in fact, have been guilty of impiety in that he encouraged the youth of Athens, by his own example, to question their elders and social superiors. This behavior would have been considered impious in that the youth were not acting in accordance with eusebia, i.e. they were forgetting their place and obligations in society. In the same way that one had to remember one's duty toward others in one's life, one also had to remember one's duty to those who had departed life. If one forgot to honor and remember the dead one was considered impious and, while this particualr breach of social conduct was not punished as severely as Socrates' breach, it was certainly frowned upon severely. Today, should one consider the tombstones of the ancient Greeks - whether in a museum or just below the Acropolis in Athens - one finds stones with comfortable, common scenes depicted: a husband sitting at table as his wife brings him his evening meal, a man being greeted by his dogs upon returning home. These simple scenes were not merely depictions of moments the deceased enjoyed in life; they were meant to remind the living viscerally of who that person was in life, of who that person still was now in death, and to spark the light of continued remembrance in order that the `dead' should live in bliss eternally. In ancient Greece death was defeated, not by the gods, but by the human agency of memory. How did life in ancient greece change after the fall of the mycenaeans? Greeks had lost the marks of civilization: cities, great palaces and temples, a vibrant economy, and knowledge of writing. What is the animal life in ancient Greece. it was almost the same as ours today except the Greeks would sacrafice there animals to the gods at festivals and games, as you know the egyptians worshipped cats, well the Greeks worshipped dogs. Kastraki (Greek: Καστράκι, before 1927: Ομέρ Εφένδη - Omer Efendi) is a village in Phocis, Greece, part of the municipal unit Efpalio. It is situated near the left bank of the river Mornos, and 3 km from the Gulf of Corinth. It is 3 km (2 mi) west of the village Efpalio and 6 km (4 mi) northeast of the town of Nafpaktos.